Welcome to our Stampin' Up! Blog Hop! and you are going to love the projects you see. you can have a "taste" of some of the fun papers Stampin' Up has to offer. on the list to be entered to win. the card base ... don't you just love how sweet the owl turned out! The Queen is planning on exploring them all! oh that owl punch is so cute! Such a cute patriotic card! OMG!!! That owl punch is absolutely darling!!! How cute!! This is such and adorable card! Love that little owl! Super cute! So cute. Like the sweet owl in the small window. That owl punch is so cute. Love it!!! Your owl is adorable! I love how you combined the colors. An owl punch!?! Now that's cool! Your project is very awesome - great job! Adorable card! Love the design and all the fun papers! That owls is awesome! Love your adorable owls!! This is so cute! Your card is so adorable! The little owl is so cute! 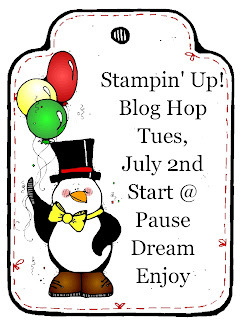 stopping by from the Celebrate Freedom Blog Hop.